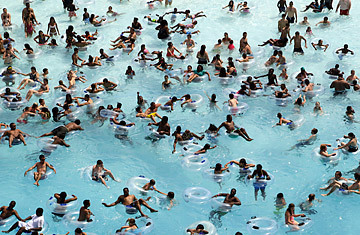 Swimmers try and keep cool in near 100 degree temperatures at Red Oaks Waterpark in Madison Heights, Mich., June 28, 2012. Conservative columnist george will has no patience for those trying to connect the extreme heat of this summer to climate change. "How do we explain this heat? One word: summer," Will said on ABC's This Week on July 8--a day on which the mercury hit 102F in Washington. "What is so unusual about this?"